SIT 81 Vaali - My City. Released on Monday 7th October 2013. Here we have the 81st release on Stories In Trance in the shape of this excellent debut by Vaali with the three track single My City. 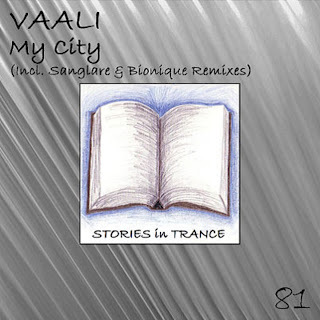 First up we have the original mix by Russian newcomer Vaali (Arthur Valiev) with his debut single My City. The warm lead melody is backed up with delicate yet potent mids, and with a sophisticated and well composed production technique it all comes together to leave us with an excellent track. A fantastic introduction to the scene by a very talented young artist. The first of the two remixes comes from Vadim Zvegintsev & Aleksander Oholov under their more familiar Sanglare guise, hot off the back of their last original track UP! under their new Invision alias which was the headline track on the Triptych EP (SIT #76). Once again they show why they're held in such high regard with us at SIT with a truly stunning remix using the fine lead melody set against deep, rich mids and bass. These guys really know how to produce big room trance! A standout track that is sure to be a big hit with DJ's and trance fans alike. The final track on this release is from Bionique (Aleksandr Voloshin) with his first solo project for us which follows his superb debut release on Stories In Trance alongside Solarnight with Heavenly Delight (SIT #73). He gives us a perfect example of his abilities with this fabulous remix; the great lead melody is backed up with an accomplished production flavour which combined with the subtle layering make this terrific track from a very promising producer.